In wartime England, an old sleuth comes out of retirement to solve the case of a mute boy and his parrot, and their connection to a murder. Chabon’s move into the world of detective fiction (after The Adventures of Kavalier and Clay, 2000, etc.) produces mostly admirable results. The year is 1944, the setting a remote British village. The retired detective who lives there in rather fearsome solitude—tending to his beekeeping—is brought back to work by the local constabulary after a recent visitor to the village turns up murdered. It’s suspected by some that another new arrival to the village may have something to do with the case. Nine-year-old Linus is a mute German-Jewish boy who stays at a local rooming house and is mostly known for the German-speaking parrot that’s never far from his shoulder. The sleuth soon realizes that issues of national security could be involved here, with spies and code-breaking à la The 39 Steps, and he has to bring all his analytical skill to bear. That he’s an impressive detective is a fact definitely agreed upon by the police, as it is by the author himself, who drops more than a few hints that the quiet old man, whose name seems to never come up, could be the great Sherlock Holmes himself, sans Watson. 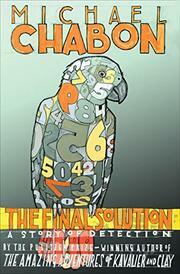 The result might be less than what Chabon fans would like to see, and also less than hard-core mystery readers would prefer. Nor does a slow start help matters any. Still, though what we have here is definitely Chabon in a minor key, he hasn’t spared any effort in its execution. The English countryside is engagingly detailed, a trip to London under the Blitz especially effective in its somber tone of wartime malaise. A fun, short snip of a detective yarn that, even so, leaves more questions than answers.